11,500 Year-Old DNA from an Alaskan Child Offers New Clues about Native American Ancestry -- The Scout Report, 05 January 2018, Volume 24, Number 1. "In 2010, a team of archaeologists exploring the Tanana River Valley in central Alaska discovered two infants that had been buried at the site over 11,000 years ago, including a six-week-old girl. The Tanana Athabaskans, who populate the valley today, named the girl Xach'itee'aanenh T'eede gaay, or "Sunrise Girl-Child." With permission from local native groups, a team of geneticists isolated and sequenced the DNA from the child. On Wednesday, the team published a report in Nature outlining what the DNA reveals about early human migration to the Americas. According to the team, the DNA reveals that Xach'itee'aanenh T'eede gaay is related to all living indigenous populations in the Americas. However, Xach'itee'aanenh T'eede gaay does not appear to belong to either of the two ancestral branches of Native Americans that scientists have previously identified: a northern branch and a southern branch. This finding supports a hypothesis known as the Beringian Standstill. 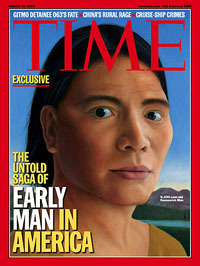 According to this hypothesis, the ancestors of Native Americans became genetically distinct from other Asian populations between 36,000 and 25,000 years ago and migrated into Beringia, which includes modern-day Siberia, Alaska, and western Canada. Approximately 20,000 years ago, after a period of genetic isolation in Beringia, some Beringians began migrating south and formed the two aforementioned ancestral branches. 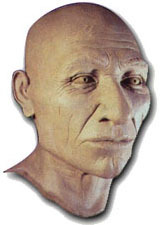 As this new DNA suggests, however, other Ancient Beringians, like the family of Xach'itee'aanenh T'eede gaay, stayed behind." [MMB] "The first two links take readers to helpful summaries of this new research and its significance, courtesy of Carl Zimmer of The New York Times and Ed Yong of The Atlantic. Next, geneticist Jennifer Raff helps explains the significance of this new research at The Guardian. Those interested in reading the research paper in full may do so via the fourth link. Those interested in learning more about the Beringian Standstill hypothesis may want to check out the 2014 essay by scientist Scott Armstrong Elias, available via the fifth link. Finally, instructors may be interested in this collection of educational resources about the Bering Land Bridge, courtesy of the National Park Service." "Who was the Kennewick Man?" Who Should Own the Bones?